Doesn't work for me either the patcher or the shortcut with -editor in the target field. • The 1.5 update doesn't applies, still 1.1.0.36. If I try to run the patcher it says ""invalid Geck", so I presume it is the Geck version that is wrong. • When I try tu use the modified fose shortcut, the geck begins to load and crashes shortly. • If there's no Geckreadme.txt there's an error while installing the 1.5 Geck update, = old file doesn't exist, so I understand the right version of the readme is needed but it's not contained in the installation archive and the ones I've found on Bethesda, (I tried them all http://geck.bethsoft.com/index.php?title=File:GECKReadme.txt) doesn't match and the 1.5 update doesn't apply. What a mess for nothing ! Does anybody have an idea on how to bypass that...thing ? The plugin and patcher can’t run without the 1.5 update. You need to run the update exe in the base Fallout 3 directory. Try also having compatibility mode set for XP Service Pack 3. @IStewieAI , Thanks for your answer. Already done what you said, same result. I think the corresponding readme is planned to be downloaded while installing the Geck main file, but as it is not available anymore , the Geck installs itself without any warning, but can not be updated to 1.5 because the right online readme version is missing. Nice idea from Bethesda to use such method to install programs like Geck; very clever...indeed. In the meanwhile, I'm going to search for this file on Steam or internet...we'll see. Edit : easier, fortunately I found a backup of my previous installation executable Geck v 1.5 and copied/pasted on the 1136 and...done. Edit" : in case some people follow the same way as I did, when starting Geck you'll have an error message "SSCE5432.dll ismissing". If you have new vegas installed, pick the dll in the FNV directory and paste it in the FO3 folder >> problem solved. I didn't find a solution for that. I must say it installs after klicking the error message but I want to be sure that nothing is missing. Any idea? Thank you for the Patcher too. Hopefully he can find the problem with 4GB patching it too, I let him know about it breaking GECK sometimes. I am sorry for being slower than usual. The reason for the Extender not working is that I have been using wrong launcher. Now when I am right on track again the Extender is as well. Thank you for being patient, IStewieAl. It is not working at all... I run GeckPatcher and all I got is "Invalid Geck.exe! "What the heck am I supposed tio do? it's not about the latest version, it's about having the exact correct version that IStewieAI states. Sorry for being slow but I still don't find the solution for a fose geck extended launcher - HELP, please. If you're using MO2, you should be able to just download and install the mod as any other mod. To launch the Geck with FOSE, you need to launch fose_loader with the arguments '-editor'. I forgot to say I use WryeBash. My problem is where do I run: "fose_loader with the argument '-editor'?" There is not an ini-file present? This seems to be beyond my capacity. Wouldn't it be better for me and newbees if you created an Extended Launcher which is placed in the Data folder? Just asking because I spend a lot of time here on FO3. If you run the Fose Patcher in the Optional Files section it will patch the Geck.exe file. After that you can run the Geck as normal and FOSE will load. I simply give up. Which planet are you on? Download the FOSE Patcher, copy GeckPatcher.exe to the same folder as your Geck.exe (the Fallout 3 directory). Run the GeckPatcher.exe, it should say "Patching Geck.exe" followed by "Geck.exe Patched!". After that you can launch the Geck.exe and it will automatically load FOSE. Are you using a mod manager such as MO2? Thank you. I use LOOT. I have a slight niggle to report, when I delete a base object (actor effects, scripts etc) in the Geck it isn't completely deleted. Loading the esm again I can see the objects are still there but blanked out and with a deleted flag on them. I then have to manually delete them properly with fo3edit. hey, guys, I'm kinda new to all the geck stuff and modding I'm not really sure how to install it. I'm using a mod organizer setup how do I know the mod is working or not? The title of the main window will have “FO3 Geck Extender” added to it. You need to run the GECK through the FOSE launcher. You can add the fose_loader as an executable in MO2 and add “-editor” to the arguments. I have the FOSE loader installed through MO. but GECK gets auto detected already and when I run it. 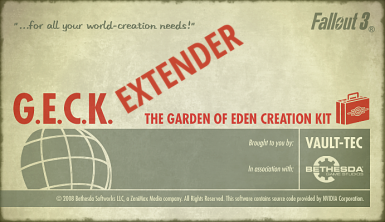 it doesn't say FO3 Geck Extender and I have the modded files in with my GECK files already. .. fill in the Title box with whatever you wish .. I call mine Fose Editor .. (as in fose loaded geck editor) ..
lStewieAl you're the real MVP man, this helped modding with the geck big time. It loads up much faster and crashes less now. Endorsed! I am very happy to see this for Fallout 3. One other thing I'd like to see is a 4GB patcher that will autoload FOSE.